Dionysius of Halicarnassus was a Greek historian and teacher of rhetoric, who flourished during the reign of Caesar Augustus. His literary style followed the classical Attic Greek in its prime. His writings showed a definite intention to reconcile the Greeks to the rule of Rome, adducing that the Romans were genuine descendants of the older Greeks. According to him, history is philosophy teaching by examples, and this idea he has carried out from the point of view of the Greek rhetorician. Being a master of rhetoric, grammar, and history, he wrote not only tracts in each of these fields, but acute literary criticism. 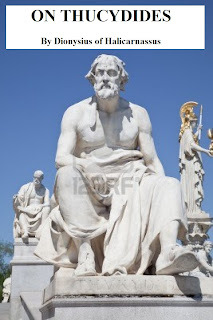 His essays have been collected in a book collectively called Critical Essays; a book in which one can find not only semblances of ancient orators, but careful analysis of their writings and speeches—Demosthenes and Thucydides are his most felicitous critical essays. His essay on Thucydides is a courageous and yet scathing attempt to cut down to size the exaggerated adulation that had been heaped over the years to Thucydides’ book The History of the Peloponnesian War. Although he attempts to be fair and balanced in his assessment of Thucydides’ virtues as a writer, the overall tenor of the essay cannot conceal Dionysius’ dislike for his famous subject—both as a historian and writer; perhaps even as a person. Dionysius wrote a treatise On Imitation —of authors deserving of emulation— but the best example of learning by imitating is by reading his essay of Thucydides, by absorbing his literary principles, and then by applying them to one’s own writing. Comments on "On Thucydides by Dionysius of Halicarnassus"